Today I'm bringing you a very basic little bear pattern. I made this bear for my Gnome. 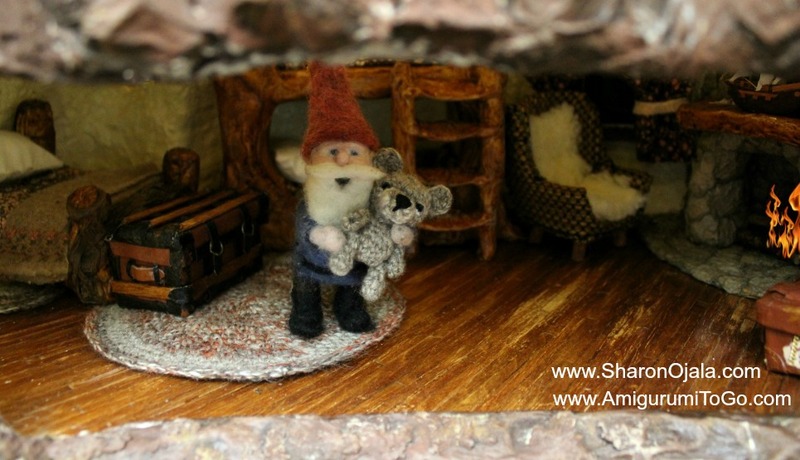 He lives in a very large Stump House that I built for him and his mother, who we call, Aunt Katri. If you've never seen this house, stop by my other facebook page, Dollhouses and The Things that Go in Them, and have a look. The house is under some renovations right now, getting a few updates and additions. Gnomey loves his big bear! He named him Barley. I did write out the pattern while working through Barley. I tried the same pattern using regular wool. I also tried it with thread but it didn't work out quite the same so I've come up with 3 options for getting the same bear. I know most of you loved Barley's face so I wanted to make sure you could get the same result. One option is a sport weight yarn, that's a #2 fine. I used Luster Sheen from Red Heart but just found out they are no longer producing it. Buy what you need while supplies last! The 2nd option is splitting yarn. I tried Bernat's Handicrafter yarn, that's a medium #4. It's super cheap. I bought a roll for 1.97 CND at Walmart. I didn't split the entire roll, I only needed a small amount to make this bear. 3rd option, hold 2 strands of embroidery floss together. 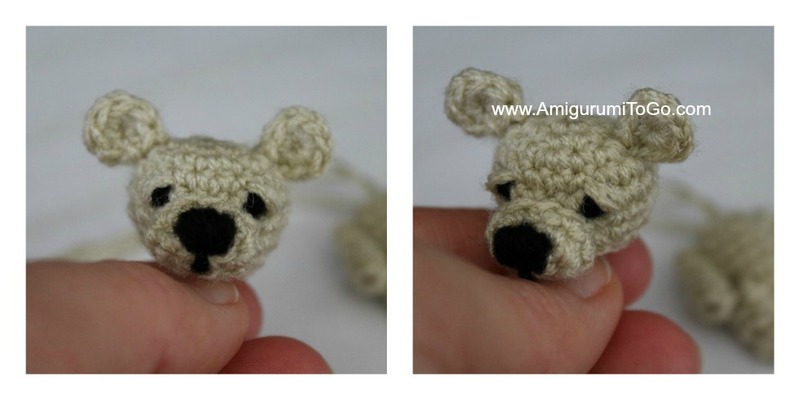 You will need 4 packs of one color to make one bear. I would say the contents in my Stump House are roughly all 1:12th scale so this bear is on the larger side for that scale. Although Gnomey loves big bears this is a great sized bear for your 1/6th scale dollhouse (barbie size). a very small amount of stuffing and something to stuff with, I used a q-tip. I also added some white to the bottom of the eye. This is optional, all you need is white thread or split some white yarn. Darning needles for sewing. I used 2 different sizes. Believe it or not, I used a size 13 for most of it then switched to a much thinner one (size?) when it got too difficult. Now to the pattern. Please feel free to play around with it. Add or take away as you wish. As I said, this is just a basic pattern. If you follow along with a thread and small hook, you will need to add rows to the head, body and limbs to make it look right. stuff the head, push stuffing to the sides to make the head more of an oval shape. You will need to reshape a few times as you sew the bear together. Whip stitch a nose using color of your choice. I used black. 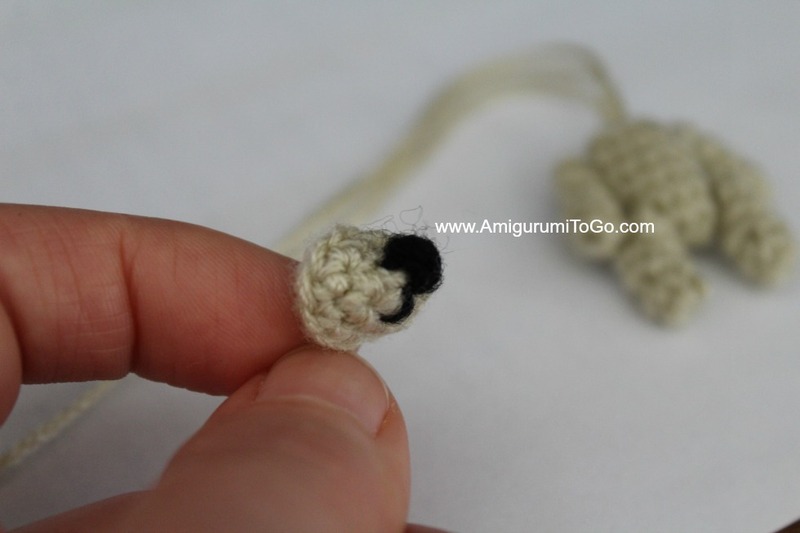 Pull the yarn tail that closes up the loop as tight as you can to eliminate the hole completely. You might have to wiggle the loop a bit. 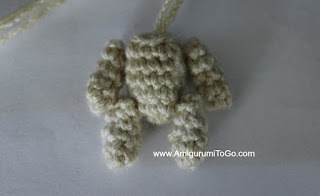 1) Sew the legs and arms onto the body. You can sew the 2 ways, jointed or not jointed. All my little bears are jointed. I'll leave the way you do this up to you. 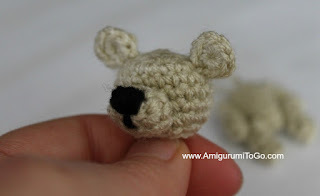 2) Sew the ears, muzzle and eyes onto the head before sewing the head and body together. 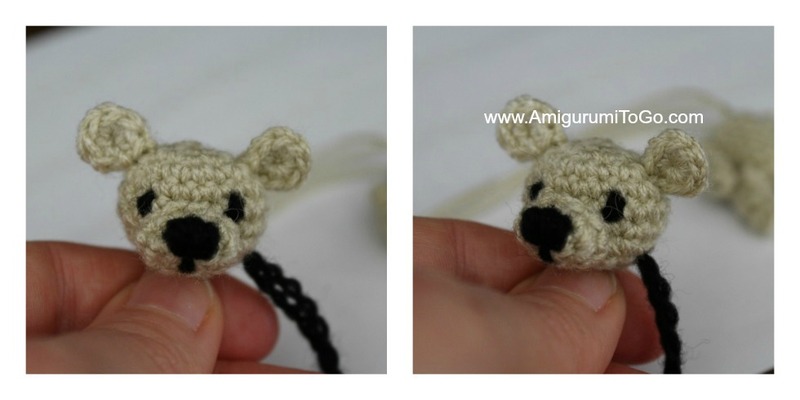 2a) The ears are up high, sewn over the 3rd and 4th row. 2b) The top of the muzzle is sewn just over the 5th row and the bottom over the last row. Take you time and don't pull so tight that you alter the shape..
2c) I added eyes by wrapping yarn vertically over the 5th row with about 3 visible stitch holes between them. 2 or 3 wraps should do it. Tip: It can be difficult to get the eyes exactly the same on each side. I cheated a little by using black acrylic paint to even out the eye size. I did this step after shaping them. You can also fill in the nose using paint if you need to. 3) Sew the head and body together. I made the head jointed by weaving the finishing yarn tail in and out of the remaining stitches of the body and pulling the yarn tail tight until the gap closes. Then pull the yarn tail up through the head, pulling the body and head together. Then bring the yarn tail back down through the body, knotting it off at the bottom of the body. You will have to pull the head back into shape before knotting it off though. The heads on my bears can twist all the way around. And you're done! I hope you enjoyed this pattern. 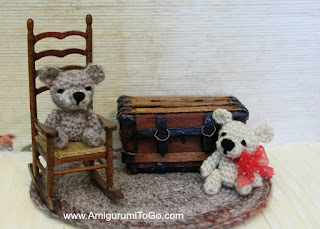 I do have a couple more miniature bear patterns right here. Sweet! Sweet! Sweet! Thank you for always sharing your delightful patterns! I've had so much fun making many of your characters and am currently finishing my second Bee Bear. When done, this will be the next project ~ or maybe I won't wait to finish the other one! I think this is perfect for a Sunday afternoon. Thanks for all your super cute patterns!! 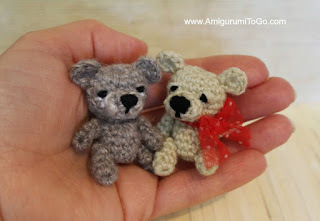 Thank you for the lovely bear pattern, furthermore a huge thank you for all the patterns that you take the time to graph and then are so willing to share with the rest of us Amigurumi lovers. Eva from Newfoundland, Canada. Adorable tiny bear with a sweet face. 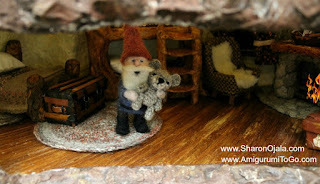 Nice friend for your gnome.